The Black Edition of the Carl Hansen chair CH25 was one of the first pieces of furniture Wegner designed for Carl Hansen & Son in 1951. First presented at the Fredericia Furniture Fair alongside a simple dining chair CH23. young designers like Wegner and certain furniture manufacturers consciously attempted to steer consumers away from buying overstuffed sets of furniture and toward investing in individual pieces. The consumer could purchase pieces of furniture one at a time as needed, to use in a variety of combinations throughout the home. The furniture had to be sturdy, but easy to move around to make housework easier. It would also be mass-produced in order to keep the price down without sacrificing quality. Besides CH23 and CH25, Wegner also designed models CH22 and CH24 (the Wishbone Chair) for Carl Hansen & Son during 1949-50. 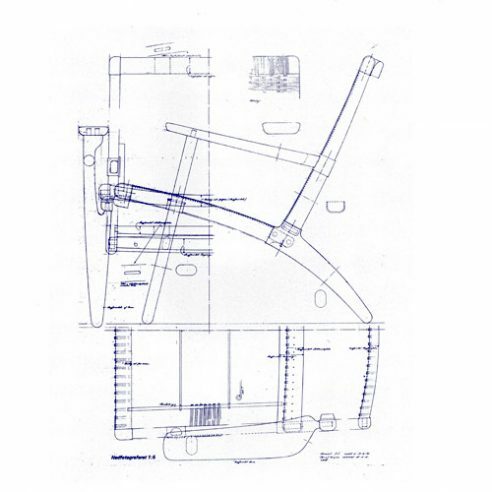 Even though the four chairs were not primarily based on the use of straight lines that would be easy for machinery to handle and thereby make production less dependent on the human hand, it was still a step in that direction. All four lived up to these new furniture demands and were also a sales success from the moment they were presented at the furniture fair in Fredericia.